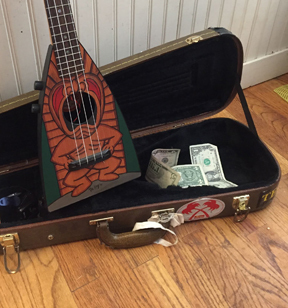 The other Davy Crockett I have seen was a Tenor scale Ukulele Made by Disney, Circa 1955. It is "Bell" shaped, harking back to the song "Ballad of Davy Crockett" which has the line "He patched up the crack in the Liberty bell". Headtock has a circular lable with a picture of Davy, surrounded by "Walt Disney’s Official Davy Crockett Guitar." plywood and particle board construction, collector value far exceeds player vaule.